These darling figurals with the japanned finish are some of the most collectable amongst the Weiss pieces! They are often featured in costume jewelry books. 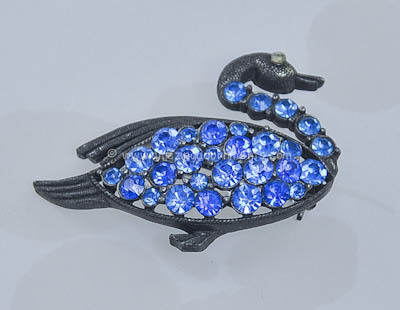 This one is a graceful swan set with sapphire blue rhinestones. The swan has a clear rhinestone eye. The hallmark appears on the reverse. Measurements: 1" long and 1 1/2" wide.